Hadrian followed Trajan as Emperor in 117 AD after the latter had an illness and died while on his return to Rome suffering a stroke. Hadrian was trusted greatly as he served Trajan over a long period of time. While Trajan attempted the expansion of the Empire and continued to stretch Roman resources Hadrian, once in power, had the opposite policy in that no further expansion would take place and boundaries would be formed at the edge of Empire. Forces were pulled out of battles Hadrian could see the Empire could do without, especially in the east, Mesopotamia and Armenia, and were brought back to former frontier lines. One such boundary was Hadrian’s Wall and he was immediately confronted with unrest in Britain, unrest that had been going on for some time. While this led to the loss of many soldiers there are no specific dates for this and the issue could easily have lasted several years. Eventually Hadrian visited the British Isles in 122 AD and laid down plans for a Wall to be built on high ground stretching from the east coast to the west. This would be placed further north of the former defence line of the Stanegate which ran a course from Corstopitum (Corbridge) to Luguvalium (Carlisle). The Wall was to have run from Pons Aelius (Newcastle upon Tyne - where a bridge, named in honour of Hadrian himself, was built to cross the River Tyne) in the east to Maia (Bowness on Solway) in the west. However, three years after construction began another fort to the east of Pons Aelius was constructed, Segedunum. For the record, there is some evidence that small posts or fortlets were built along the south bank of the Tyne from Newcastle to South Shields but nothing to suggest it extended down the eastern coast. The full distance from east to west being 76 Roman miles (just over 80 modern miles), 10 feet wide and built from stone for the eastern 45 miles and 20 feet wide at its base and of turf and timber for the western 31 miles from the River Irthing. The exact height is unknown as are the designs of the highest parts of the Wall. Bede states upon his own observation that the Wall was at a height of some 15 feet and this is generally accepted without real evidence to verify it as yet. Stairways at Milecastle 48 (Poltross Burn) and Milecastle 37 suggest possible heights of 12 to 14 feet and 13 feet 8 inches respectively although a few years ago a study of gate arches suggested a height nearer the estimate made by Bede. It is not fully understood why the eastern side of the Wall was stone built while the western side was of turf and timber. Theories have been put forward of course. The turf and timber sections could have been built in a hurry to affect a quick finish to the build if the army came under attack from South West Scotland. There were forts to the north of the Wall in this region and maybe this disproves that theory as troops would be stationed there to protect from attack those building the Wall. However, it has been said that the stone was not plentiful enough in the west although the turf and timber Wall were later rebuilt in stone in parts so it had to come from nearby. There is also strong evidence of heavy forestry in the west and maybe this had a bearing on the decision to utilise local materials while not transporting heavier stone as the Wall continued its build westward. Forestry is less evident in the east. 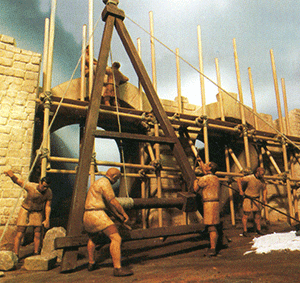 Building the western side first in turf and timber and later in stone backs the theory that local resources were utilised as much as possible and only changed to stone when convenient to do so. The Wall was to have been ten feet thick and started out thus but later the thickness was reduced to six feet. Again many theories have been put forward without explaining the reason why this was done. A parapet (wall-walk) and crenellations are often proposed but no evidence again is solid enough to prove they existed. Some of the wider ten foot bases for the Wall can still be seen today with the narrower gauge Wall atop. Stone blocks used to build the Wall were generally 15 to 20 inches in length, 9 inches deep and 10 inches in height and were the outer face of the visible Wall. An inner core would be composed of concrete and rubble. The earthen portion was an early example of cut and fill engineering with the Wall formed from material excavated from the ditches. The sizes of the cuts of turf were laid down in a later military manual as 18 by 12 by 6 Roman inches. It is not known if these sizes were strictly adhered to throughout by the soldiers involved in the build.